Last Saturday, Old Wesley bounced back from their recent narrow defeat to Naas with a convincing bonus point victory over visitors Ballymena in Energia Park, Donnybrook on a final score line of 27-16. Whilst this 5 point victory only moves Wesley up one place to 7th on 15 points, they are only 1 point behind 4 teams locked in joint third place on 16 points, emphasising the very competitive nature of this division. 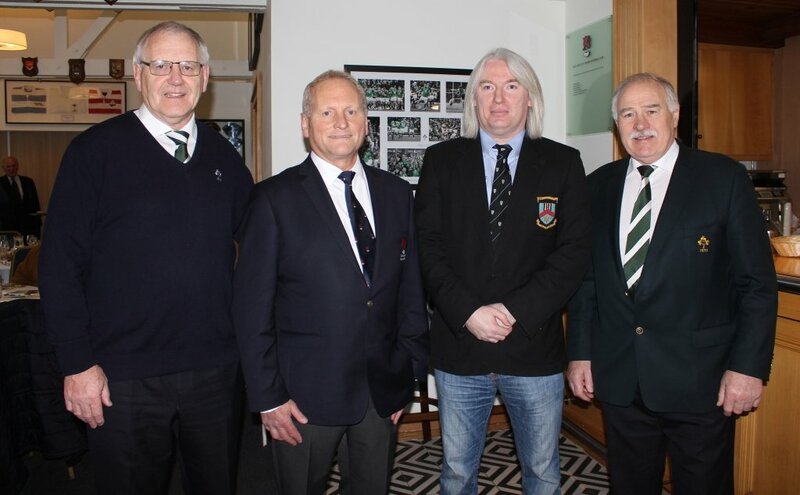 The two clubs were honoured with the attendance at the match of the current President of the IRFU, and Ballymena club member, Ian McIlrath, and the immediate Past President of the IRFU, and Old Wesley member, Philip Orr. See photo below. Wesley opened brightly and early pressure forced a penalty which Stynes pushed to the right. Ballymena, with a slight wind advantage, got a foothold in the Wesley half after a line out turnover and out half, Tim Small converted a penalty on 15 minutes, to open the scoring. Despite some strong carries from O’Dea and Rowley, a penalty infringement at the breakdown kept Ballymena in the lead. On 26 minutes, there was a key moment in the match when Ballymena full-back, Roger McBurney appeared to receive a harsh yellow card. On 33 minutes, Wesley capitalised ruthlessly on the numerical advantage, when Mark Rowley made an excellent break up the middle and showed wonderful vision in throwing a long pass to winger, Tommy O’Callaghan, who still had 2 men to beat before grounding in the corner for an excellent unconverted try – 5-3 Wesley. Ballymena struck again just on half time with another well – struck penalty by the left- footed, Small, to go into the interval with a 6-5 lead, which didn’t really reflect the 65 per cent possession Wesley had in the first half. On 43 minutes, the Ballymena centre, Alan Smith, made a great break only for Wesley’s, Tom Kiersey, to make a vital try-saving tackle, only for Wesley to concede a penalty under pressure, for Small to extend the lead to 9-5 for Ballymena. The next score was vital and it fell soon after to Wesley, when Stynes knocked over an easy penalty- Ballymena lead 9-8. Wesley began to open up and capitalising on their greater fitness. They stretched Ballymena across the back line and Jeffares was just held up short of the line. On 58 minutes, the incessant pressure, with Pim, O’Dea and Rowley to the fore, finally told when Kiersey, showing his customary pace, cut through the Ballymena defence to ground near the posts, for Stynes to add the points to push Wesley into a 15-9 lead. Ballymena, to their credit, tried hard to get the next score, but a wonderful cameo by O’Dea, where he followed a ruck steal with a kick block-down, led to a great break by Jeffares, with Rory Stynes finally dotting down beside the posts. He added the points himself to push the margin out to 22-9 and, with 13 minutes left, the vocal home support dared to dream of a bonus point. The Wesley team did not disappoint on the field and, on 70 minutes, Kiersey, who controlled the game well throughout, capitalised clinically on a large overlap by cross – kicking to the corner and it was fitting that O’Dea gathered to crash over in the corner for the vital 4th bonus point try – Old Wesley lead 27-9. Ballymena fought back and had the final score of the match when Connor Smyth crashed over from a rolling maul, with ace goal kicker, Tim Small adding the points. Wesley almost snatched another try before “no side” but Darren Horan was adjudged not to have grounded the ball, before referee, Richard Horgan, blew the final whistle. This was a good performance by Wesley, with the pack putting in a solid performance, on the back of an excellent scrum platform and this augurs well for the team, with some strong challenges ahead in the coming weeks.